Sky Q has been out for two years and, if anything, it is now even better than the five-star system that we tested originally in our Sky Q review. Sky has released a number of updates to the set-top box that have improved its navigation, features and - especially so thanks to its new deal with Netflix - 4K, HDR, UltraHD content. And, considering the amount of great Sky Q deals there are on the market right now, there has never been a better time to pick it up. Before you do though we feel it is worth reading our detailed guide to Sky Q, which provides useful information on Sky Q installation, Sky Q cost, Sky Q bundles and where you should be shopping. Sky Q is a new way for you to "watch what you want, when you want". Essentially you can drop and pick up recordings and on demand programmes or Sky Store purchases seamlessly, whichever room you're in. Plus there are new ways to take your recordings with you, too. It's designed to be Sky's top-end offering and is priced as such. Today it has never been simpler to enjoy Sky Q, too, thanks to Sky bringing in a flat £20 monthly cost, which can then be augmented as you see fit with extra paid content such as Box Sets, Sky Sports and Sky Cinema. All this content is seamlessly navigated and accessed through the Sky Q set-top box, which comes in one of two different flavours, Sky Q 1TB and Sky Q 2TB. Sky Q is available to buy in both the UK and Ireland and you can specify the bundle you want as well as the box - see below for more on these. Home installations are available and vary in cost depending on which Sky Q box you plump for. The Sky Q 1TB box carries a one-off £20 setup cost. The Sky Q 2TB box carries a much heftier £199 setup cost. This can be brought down to £65 if you select to purchase Sky Q Multiscreen for £12 per month. These links will take you to Sky's site where you can buy Sky Q or find out more. Which Sky Q devices are available? Sky Q is powered by some new devices. There's a new home screen and programme guide plus a top-end Sky Q Silver 2TB box that can record up to four channels (there's actually 12 tuners in the box). 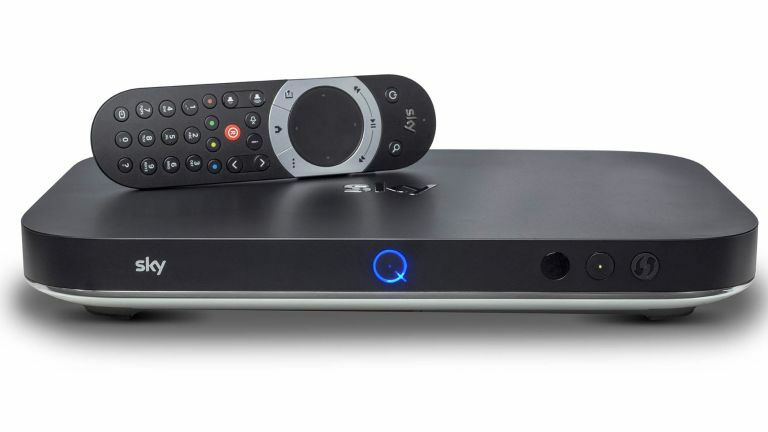 The standard Sky Q box is less good, but a drastic improvement on Sky+HD. You can watch up to five things at once on TV and mobile devices - more on that shortly. There are several hardware options for Sky Q as well as an app for tablet and phones, too. Check out the hardware below. Set-up costs for Sky Q are from £99. But then it can seem a bit confusing. If your bundle has Sky Broadband or Sky Sports or Sky Movies things are cheaper - £99 for the standard box and £149 for Sky Q Silver on the standard bundle and £99 if you have the Silver bundle (see below). If you don't subscribe to any of Sports, Movies or broadband then set-up costs are £249 or £299. Quite a bit. Clearly Sky wants to you to have the premium content - doesn't it always? According to Sky, the typical monthly cost for existing Sky+ customers will be around £12 extra compared with their current Sky+ package. Broadly, the good news is that the costs are cheaper than we thought they might be. Sky says that some customers could end up paying as little as £1.50 more a month for Sky Q. For new customers joining Sky, the ongoing monthly cost for Sky Q will start from £42. Then you need to factor in Sports and Movies if you want those. That's around £76 a month total as the starting price for Sky Q with all the content. That's not including the Sky Q Silver box which is £12 more a month - see below for the bundle details. So for the Sky Q Silver top end package most people will be paying around £88. It seems from the set-up costs info, you can have the standard Sky Q bundle on the Silver box, which is all very confusing - surely it would make sense to have the Silver bundle the only thing on the Silver box. Or at least called them different things. All customers who already have Sky Broadband or who purchase Sky Broadband when buying Sky Q also receive the new Sky Q Hub for free. Interestingly Sky Q installations will be phased with Sky Broadband customers receiving the product first. The nearest equivalent bundle in terms of content (range of channels, HD and Sky Box Sets) to Sky Q is the Family Bundle (£36). One Sky Q Mini box is provided with the Silver Bundle. Sky Q Silver customers wanting to view on a third TV screen can pay an extra £99 and will receive an additional Sky Q Mini. Providing you have a Sky Q Silver box, you'll be able to access Ultra HD from Sky Q at no extra cost. Starting with Leicester vs Hull on 13 August, Sky's Ultra HD offering will include films, natural history documentaries and dramas. There will also be over 70 movies, including the world premiere of Spectre in Ultra HD, The Revenant, and The Martian (which we've seen before in Ultra HD – it's ace). Five new dramas will also be available in Ultra HD including The Young Pope starring Jude Law and Series 4 of The Blacklist. There will also be plenty of natural history and documentaries, including David Attenborough's Conquest of the Skies and Sky 1's Big Cats, which we saw in Ultra HD at Sky's demo. The biggest box office hits 12 month before online subscription services. Plus enjoy Sky Movies Disney, including the latest releases and all-time classics. Including live coverage of the Barclays Premier League, Sky Bet Football League, domestic and international cricket, F1®, boxing, golf and many more of the biggest events in sport. How does that compare cost-wise to what's available now? Sky sent us the example of someone who already takes lots of services – they really love their TV. They might have the Sky+ Family Bundle, Sports, Movies and a Multiscreen subscription – total cost £87 a month. To upgrade to Sky Q Silver would only cost them an additional £1.50 a month, plus a one-off set-up and installation cost of £149. As we said above, the nearest equivalent bundle to Sky Q in terms of content (range of channels, HD and Sky Box Sets) is the Family Bundle for £36. Another example person who takes fewer services and has a lower overall monthly TV bill might prefer to upgrade to Sky Q, rather than Sky Q Silver. If they are currently were on the Sky+ Variety Bundle, and also have Sky Broadband, they'd currently pay £40 a month. To upgrade to Sky Q, it would cost them another £12 a month, plus a one-off set-up and installation fee of £149. As well as the main Ultra HD box, you can have up to two 1080p Sky Q Mini boxes that doesn't to connect to the dish (it uses your network to connect to the main box). Whether you can have one or two of these boxes depends on which main Sky Q box you have (one for the standard, two for Sky Q Silver. You can have up to two of these and also watch on up to two tablets at the same time as well (there's a new Sky Q tablet and phone app to facilitate this which completely replaces Sky Go for Sky Q customers). There's also a Sky Q hub, which is a new Sky Broadband router that also includes Powerline. You can use Sky Q with other broadband providers, but the Sky hub is an all-in-one solution. If you use Sky Q with the Sky Q hub, then every Sky Q box also becomes a Wi-Fi hotspot (extender) meaning that you can have a stronger Wi-Fi network, too. The new EPG features My Q, which shows you recently watched stuff as well as a curated selection of things you might like. Q Sync enables you to also synchronise your recorded shows from your Sky Q box to your tablet - or your phone. These are encoded for your device by the main box on the fly. There's also a new Bluetooth touch remote plus a powerful new search function so you can find anything from on demand, catch-up and recordings as well as get recommendations. Bizarrely, there's also a non-touch remote available too. The Sky Q box also has a button on top so you can find your remote. Personally we don't have a problem with lost remotes but we know people that do. Voice search will launch in due course. Sky Q also boasts a few streaming extras such as YouTube, Spotify and AirPlay plus Bluetooth integration, but many streaming rivals already boast these options. Want Sky Q but not got Sky already? If this is the case and you want a Sky Q Silver bundle, enabling you to watch Sky in two rooms and on two tablets. This will cost you a minimum of £54 per month. Adding Sky Sports will cost an extra £25.50, Movies £17 (or add both for £34.50). So without Sky broadband you'll pay £88.50 per month and a one-off cost of £99. You don't have to pay for the equipment as you're loaned it by Sky – much like Virgin Media does. Want Sky Q but got Sky already? If you already have Sky, it'll likely cost you around £12 extra per month for the regular Sky Q bundle (one room and one tablet) or an extra £28.50 for the Silver bundle. You'll also have a one-off cost of £149 – for TV services and smart services. The only way you'll get a rock-solid price is by going onto the Sky shop at sky.com or calling up a sales advisor on 08442 411 809, but this will give you a rough guide. Liked this? Why not read Sky on-demand streams top two billion so far in 2015 and our Sky Q review.